MMK have been stable performers at Abbey House Hotel & Gardens for over 5 years, I have a good working relationship with all of the band. It’s refreshing to find a group that work hard to be part of the team and do all they can to ensure our guest experience is one to remember. Able to perform a wide range of music from ‘The Undertones’ to ‘Madness’, ‘MMK’ truly entertain across the music spectrum and provide a great night for all age groups. Myself and my new husband booked My Mate Kate for our wedding, on the recommendation of John at Abbey House, and practically every member of staff we spoke to, asking for their opinions! They are obviously thought of very highly there, so we booked, and we were certainly not disappointed . . . . Such a lovely group of lads, smartly dressed and a pleasure to have at our big day. And as for the music . . . Simply amazing!!!! Our friends and family are still talking about them, they got everyone up and partying, loads of energy and fun, great choice of songs, and most importantly for us, they learnt our favourite song especially for us on the day. It was played beautifully and we cannot thank you all enough for making our day so special and fun. I wanted to thank you guys for doing such an amazing job at our wedding on 27/12/16 at the Marriott in Worsley Manchester. The music was fantastic, we had so many compliments from so many guests on how great you guys were, you completely transformed and made the wedding night. You’re all a great set of decent lads too, it was a pleasure to meet you guys again. Please use this on your testimonial page! 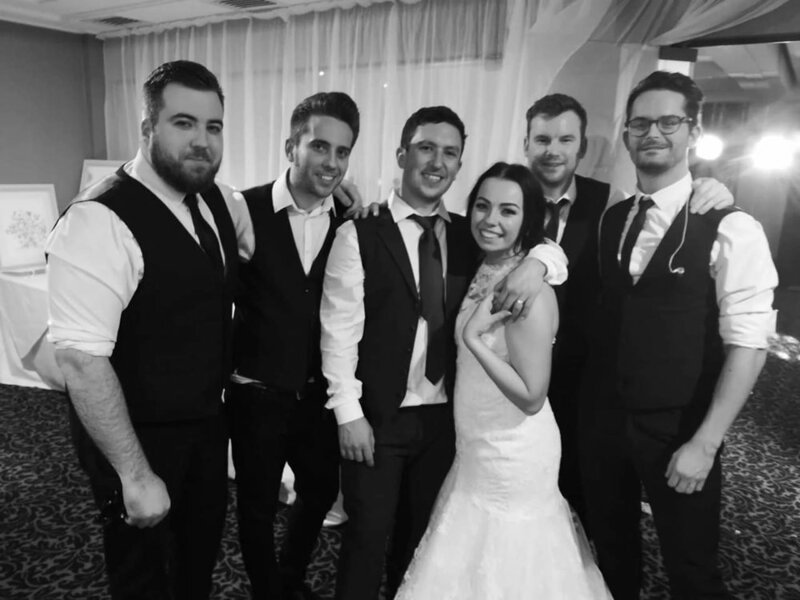 Just wanted to say a massive thank you for playing at our wedding night do at the fairway! Sorry I haven’t messaged sooner - straight back into work! Yous were just amazing! Everyone had a brilliant night and loved yous! I just want to say a huge thanks for your performance last night. Everyone thought you were amazing. We go to a lot of functions and you are by far the best band we have heard in a long time. You made our special day all the more special by getting everyone on the dance floor.